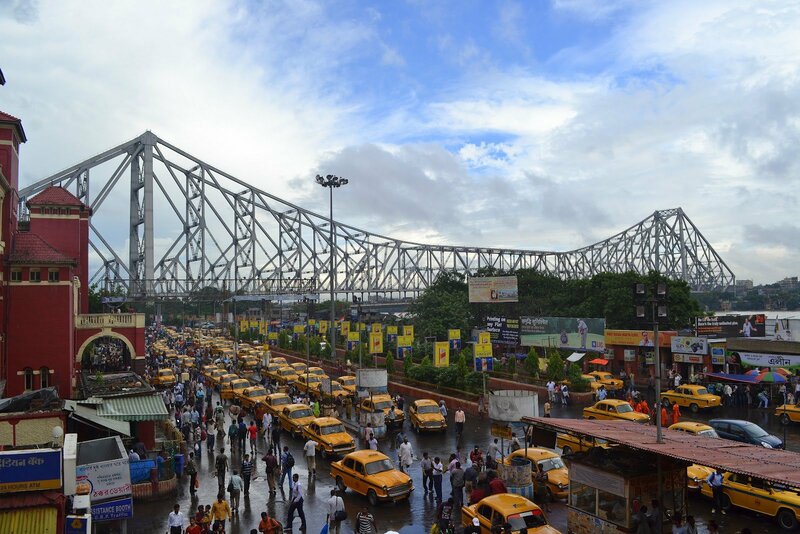 Kolkata, the new name of Calcutta since 2001, was once the Capital of India during the British Raj until 1911, and is now the third largest city of India and fourteenth largest metropolitan in the world. Located in Eastern India on the eastern banks of the holy river Hooghly, it is an interesting place to visit in many ways. Having spent two years of my life there, I sure can give sound judgment on that. Kolkata has a tropical wet-and-dry climate. Summers are hot and humid, with temperatures in the low 30's and during dry spells, the maximum temperatures often exceed 40 degrees during May and June. Winter tends to last for only about two months. Even then, the real chill is mainly during January. The best time to visit this place is September-November, especially since during this period, you could catch the Durga Puja Celebrations in its true Bengali spirit. On your first day there, you could hire a taxi, those yellow painted Ambassador cars which run on meter and tell the driver to take you to Victoria Memorial, inevitably the most popular tourist attraction of the City of Joy. This white monument has a museum documenting the city's history, recently air conditioned for your comfort. Here, you get a chance to go back in time and relive the gone era of the Social Reforms, Bengal Renaissance, the British Raj and freedom fighters. After having spent hours walking and seeing so much of our History, you could walk into the lawns of the Memorial, stroll around to see the beauty of the nature and the beautiful monument, or just sit back on the lush green lawns next to the small lakes there and let the cool breeze whiz past you. From here, you could walk down to the St. Pauls Cathedral which is just across the road from the Victoria Memorial near the Park Street Flyover. One of the most beautiful Cathedrals in the city constructed during the British Rule in sheer white. Sitting there for a few minutes in complete silence connects you with The Almighty, and brings in introspection within you; a real change from the mundane life that runs in the fast lane. Having spent the day here, if you believe yourself to be a shopaholic, then you could move towards Camac Street in the evening and loosen up your pockets at stores such as Westside, Pantaloons and other popular brands, all located in a row on this street. I am pretty sure that after this, you won't really have the stamina to go elsewhere and hence, just get back to the cozy comforts of your hotel room and start off again the next day. Go get the cab and head towards Fort William. One round around it and you will realize how huge the Fort is. Old Fort William, located near the Hooghly River, now serves as the Canttonment Area of the city, with mainly the Armed Forces occupying the area. Entry into the Fort is restricted to Defense Personnel only, so if you have any contacts in Kolkata in the Army or Navy, tell them to take you to the Fort to see the architectural ability of the craftsmen 200 years back. You could have a look at the modern Army Officers Institute and the Fort William Golf Course which is one of the three 18 hole golf courses in the city, the other two being Royal Calcutta Golf Club and Tollygunge Golf Club. Adjacent to St. George's Gate, Fort William is the James Princep Monument and the Princep Ghat, a local train station. A mind blowing view of the Vidyasagar Setu mounts above you from here, and beautiful pictures of the sunset at the Hooghly, keeping the twin bridge of Howrah in the frame can be taken from here. Hereon, you could move to the famous Howrah Brigde. Have a look at the exquisite structure, one of the longest bridges of its types in the world. Cross the bridge and you land up in the twin city of Kolkata-Howrah, ask the cabbie to take you to the Dakshineshwar Temple from here. The presiding deity of the temple is Bhavatarini, an aspect of Kali. Return by the evening and head to Park Street if you love to party and eat. The place houses some excellent restaurants. Also, if you're a party animal, then Calcutta is the place to be in. Groove into the night in pubs and discs like Underground at the Hotel Hindustan International, the best around. Kolkata's night life has indeed become among the best in the country lately, with people dancing away till 4am! After having relaxed and giving time for your sore heels to heal, it's time to move to catch any matches, cricket or football, going on at either Salt Lake Stadium, the largest in the Indian Sub-Continent and the second largest in the world, or the famous Eden Gardens. Kolkata is known for its large stadia. Kolkata is one of the major centres of football activity in India, which is evident from the presence of legend Maradona in 2008. Kolkata is also known as the Mecca of Indian Football. Calcutta Football League, which started in 1898, is the oldest football league in Asia. Kolkata is the home of top national Sports Club like Mohun Bagan AC, Mohemedan Sporting Club and East Bengal. Matches or no matches, one look at them is a good idea for sure. Some notable sports stars from Kolkata include former Indian national cricket captain Sourav Ganguly, and Olympic tennis bronze medalist Leander Paes. Another place you must visit while in Kolkata is the Kali Ghat. As the name suggests, the temple is dedicated to Ma Kali. Thousands come to offer their prayers daily to the holy Goddess, Ma Kali. Mostly, you'll find it crowded at possibly any time of the day. In case you wish to see the local areas here, Behala- the locality that houses the home of Cricket star Sourav Ganguly is a good option. The place screams Bengal! Some popular markets in Kolkata are New Market, next to the Grand Oberoi, Fancy Market in Khidirpur Area and Behala Market amongst others. Want to get a souvenir dress from Bengal, then go and look at Rammandir, Chittaranjan Avenue, you'll find beautiful exclusive collections of the famous Kantha work of Bengal. And while out shopping at these places, do indulge in the famous phuchka's (or golgappa's, as we North Indians call it) of Kolkata. They are a real treat. You'll also get a chance to hog on rolls here-there's a variety on this one. You'll get it all-chicken roll, mutton roll, egg roll, paneer roll, vegetable roll, kathi roll etc.